Guardian Central is a multi-cabinet integrated 1350 to 6750 amp DC power system providing an output of -48VDC. Each 2.1m high cabinet can accommodate up to 24 Guardian family high efficiency hot-swap rectifiers along with AC input and DC output distribution. 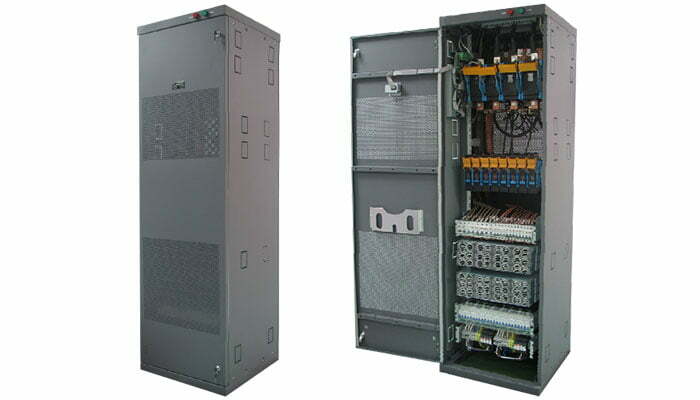 A load current of 1100A plus 250A for battery charge is available from each cabinet with a maximum system capacity of 5500A when 5 cabinets are connected in parallel. The rectifiers are internally fan cooled with speed control which is a function of load and temperature, keeping acoustic noise to a minimum. Each cabinet can provide up to 4 bulk DC outputs at 384A or 600A via fuses or MCBs. Additionally a maximum of 72 lower current distributed outputs are available via MCBs rates from 6A to 63A. Batteries are protected by a combination of an 1100A low voltage battery disconnect (LVBD) and fuses or alternatively using MCBs. In both cases a 1500A shunt is used to measure battery current both while charging and discharging. Matching load distribution cabinets allow for extra DC output distribution with the same options as for the main system cabinets.